I was at the mall last weekend and just stumbled my way into Sephora...oopps! My excuse was to buy a bathmat at Sears but I know at that particular mall, Sephora is right beside Sears hehe. I had on my wishlist a few different items; the smashbox Try Me Kit II, UD primer potion, UD Naked Palette, and the Tarte TrueBlood Palette. Everything was either not stocked anymore or sold out with the exception of the UDPP. WAHHH! 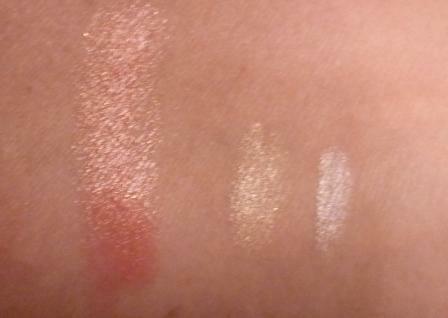 Last month when I went to Sephora the same thing happened! AGHH! Of course I did not walk away empty handed. I grabbed the UDPP in Eden. Now I get to finally see what all the fuss is about. I also bought a Sephora flat eyeliner brush ($17), Sephora lip gloss ($3), and a Sephora eyelash curler ($7). This curler is plastic. I wanted to give it a try since I am allergic to metal curlers. So far I have only managed to pinch my eye lid LOL. 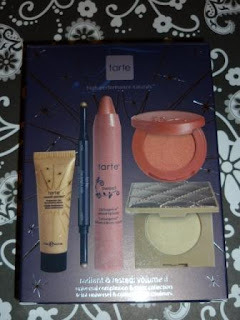 And I bought the Tarte Radiant & Rested: Volume II Universal Complexion & Color Collection –a 5 piece kit - $54 CDN ($42 US). I had been trying swatches of the Trueblood display palette and this kit was displayed beside it. So I tried some of serum on the back of my hand in it is like a light foundation. I think I will try mixing this with some foundation. 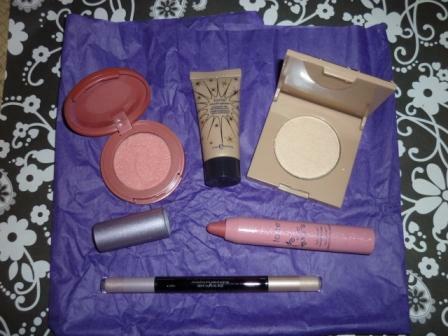 The blush that is included in this set is a very pretty peachy pink. I am liking this blush. Alot. It’s a perfect colour for summer. I am not sure about the 12 hour claim but I will be testing this out. I have only used the eye brightener a couple times, using the smaller champagne side as a highlight in the inside corner of my eyes. It’s nice but not something I would probably buy on its own. The LipSurgence Luster pen is maybe a little too pink for me but I am not giving up on it. It is very moisturizing but I have been wearing it in the morning and I noticed that it gone as soon as I have my coffee. Maybe I am doing something wrong but I thought it was supposed be like a lip stain? Maybe the colour is not working on me?? I am still playing around with this kit so I will give a more in depth review once I have tried everything. On a side note, I received a sample of smashbox’s Photo Finish Luminizing Foundation Primer. I received an email from Sephora Beauty Insider promos -get a free smashbox Photo Finish Luminizing Foundation Primer with purchase. You are supposed to print the email and show it at the checkout but I forgot and just mentioned I received the email and they gave it me anyway. I tried the primer on Monday and now this is my favourite primer LOL. Damn those samples!!! It seemed to be tinted but it went on sheer. It left a wonderful glow even with the foundation over top. WOW. I am hoping the Tarte Smooth Operator serum works as well this primer J.
I just picked up one of the 12 hour blushes too! We'll have to see how long they really last! That color looks very pretty. I agree, great for summer! Haha, I hope you still made it to Sears for the bathmat! Bathmat? what bathmat? LOL Yeah i got it HAHA. You are going like the Tarte blush!